Dear Toria, I can’t my grandkids won’t be with me for Christmas. Why would their parents take them on a vacation now? Dear Toria, I want to skip my company’s holiday party. How can I get out of it? Dear Toria, My wife is obsessed with buying the perfect gift for her best friend. How do I convince her that gifts aren’t the point? Dear Toria, I’d like to host my family’s holiday gathering this year. I know that I throw the best parties, but my brother thinks they’re too loud. Who’s right? Dear Toria, My husband and I have always had a quiet, intimate New Year’s Eve celebration. But now he wants us to go to his friend’s house instead. Wait, what? Dear Readers: Each year, I receive an abundance of letters asking how they can best address issues related to the holidays. The holidays are replete with meaning and tradition, guaranteeing that fun and ceremony will co-mingle with dashed expectations and pushed buttons. To help keep relationships healthy and happy throughout the holidays, following is my brief summary of things that matter the most to each of the Five Element personalities, and things that don’t. There are also some suggestions about how to keep the holiday season joyful for everybody. Water Personalities: In the Five Elements Philosophy, the hustle and bustle of the holiday season falls within Water time, at least in the northern hemisphere. Winter is generally a time for contemplation and quiet, setting the tone for Water personalities’ lives. Water personalities appreciate the true meaning of the holiday season. They may participate in events that they think are important, but you might still have to coax them to join. When they show up, help them feel comfortable and welcome by finding a smaller group of similar people with whom they can engage in meaningful conversation. Be gentle with Water personalities and keep in mind that if the event gets too intense, they may float off to a quieter location for a bit. Time alone is still of paramount importance to Water personalities. Wood Personalities: Wood people approach planning for the holidays with zeal and zest. There make lists for gifts, set deadlines for shipping and mailing, schedule events, and so on. Woods are driven to do this to help keep the holidays from feeling too chaotic to them. In the Five Elements Philosophy, Wood is the channel between Water and Fire, or mystery and celebration. More than at most other times, Wood personalities need influence from both Water and Fire during the holidays. Business shouldn’t be an issue for them, but they’ll still need down time. Whatever they do, if a Wood spins out, remind them that gifts and events mean less to people than the true spirit of the season. And if you want a Wood person to enjoy a holiday event that they didn’t plan, give them a role to make them comfortable and to ensure that they have a good time. Fire Personalities: Having a Fire personality around guarantees liveliness and happiness. In the Five Elements Philosophy, Fire relates to summer, which is a season of abundance, merriment, and action. Winter can be a dreary time for Fires, to the chance to get together with other people and celebrate for any reason during the holidays is generally quite welcome. Parties are fun, spontaneity abounds, and everything is awesome during the holiday season for the majority of Fire personalities. If they have the opportunity to connect with other people and to be at the center of attention, they’ll usually be happy. With that said, Fire personalities may need help setting boundaries when it comes to how many events they can participate in and keep their sanity. If you offer this help, your Fire family and friends will be able to light up the holiday season without literally burning themselves out. Fire is about transformation and inspiration, so don’t be too surprised if Fire personalities are particularly drawn to events that inspire action or have a cause. Earth Personalities: Most holiday events involve gatherings with friends and family, which is important to Earth personalities. Almost every gathering includes food—especially sweets—which is akin to Earth heaven! 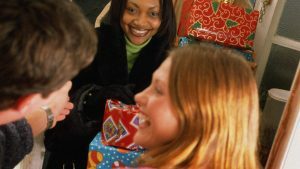 Long-term connections are deeply important to Earth people, so their activities during the holiday season will focus on spending time with their loved ones. Earth personalities love to give hand-made gifts, so be patient and let them express their love. But help them avoid becoming overwhelmed by reminding them that bigger does not necessarily equal better. In the Five Element Philosophy, Earth represents balance. But even Earths can overdo things. Metal Personalities: During the holiday season, Metal personalities may need help to get into the holiday spirit. They may see frivolity as a waste of time. But they’re kind people who bring much wisdom to gatherings, so coax them into joining and everyone—even the Metals—will be glad that they did. Metal holds the last elemental position, so Metals can usually manage transitioning to a new year fairly easily. But sometimes, being reminded of somebody who’s no longer with them, or ending a year, can make a Metal person sad. The best way to help Metals avoid this is to include them in holiday activities where Earths can nurture and feed them, and Fires can enchant and delight them. The Metal may protest, but holiday gatherings are generally good for them. The bottom line is that inherent in each Five Element personality are both positives and negatives. With this knowledge, we can enjoyably interact with everybody, and deepen our relationships as we do. And that’s certainly something we can be thankful for. Happy Holidays, everybody!